For some time now I have been thinking about the number of stationery items I own, versus what I regularly use. In most cases I use a lot of what I own, regularly rotating through items that I use. However I have noticed that I have a particular problem with paper. I have always loved using notebooks and in the past I would get frustrated with poor paper quality, feathering and bleed issues. After I discovered the Pen Addict podcast I started buying my paper online, discovering new brands that eased my paper woes. I now own a large amount of paper, more than I would ever use. My issue seems to be really prevalent with pocket notebooks. Initially this was in part fuelled by the crazy collectable, and in part, competitive nature that exists around Field Notes. You don't really have to search very far to see people desperate to have all the new releases and buying up large quantities of limited editions. Many people will have a problem of hoarding notebooks so I am not alone, and my stack is probably much much smaller than most, but to get a real idea on how bad it was I decided to write a post on the number of used and un-used notebooks I own. In total I have 50 used pocket notebooks. I started using pocket notebooks around the Day Game Field Notes release which was in summer 2012, so I can presume I picked up a pack here in the UK any time in August or September 2012. From here I started regularly using Field Notes pocket notebooks and carrying them around with me all the time. Between summer 2012 and present day I have used 45 Field Notes books, 2 Doane pocket notebooks, 2 Calepino pocket notebooks and 1 Nock Co pocket notebook. That averages out to around 1.25 notebooks per month, and I would say about 95% are fully used, front to back. Field Notes have dedicated section on the inside cover for your personal information and due to this I have developed the habit of dating each notebook I use. I have found dating a notebook can be very useful if I need to find a note again later on and I have now extended this habit into all notebooks that I use. This is where we have a slightly different story. I have quite a few un-used notebooks. Based on my use rate I have a healthy supply so there is no risk of me running out any time soon. I own 122 un-used pocket notebooks. This is made up of 6 Doane paper pocket notebooks, 3 Calepino, 2 Baron Fig, 3 Word, 5 Nock Co, 2 Dot Grid and 101 Field Notes. I have tried a good range of pocket notebooks as you can tell, but again Field Notes are by far my preferred choice. This is not down to paper quality - we all know they don't handle ink very well, and it is not because I have the bug and have to have them all. It's because I like the style of a Field Notes pocket notebook. I like the designs that are release, I like the size of the notebooks and I like the fact that I can buy these easily and freely in the UK. Essentially I think they are a pretty good notebooks for throwing in my bag and carrying around for me and scribbling down, mostly unimportant, notes. I am not precious about keeping the perfect notebook nor am I trying to protect or collect these notebooks. They are there to be used and abused and that's how I use them. I have 19 sealed 3-packs of Field Notes. Mostly these are extras of a seasonal release that I bought thinking I would love a particular release. For example I have 3 unopened packs of Cold Horizon because I thought I would love this edition. I was enticed by the lovely blue covers and I bought without trying the notebooks out first in fear that if I didn't stock up I would miss out. I had a similar experience with the Shelterwood edition. I bought these from Field Notes HQ in person on a visit to Chicago and bought several packs due to the thicker paper stock and ruled grid thinking I would use them with fountain pens all the time. Turns out I am not the biggest fan of the wooden covers. Others are just the second 3-pack that I bought and due to the sheer amount of Field Notes that I have I haven't cracked them open yet. I have 18 singles of Field Notes. Usually these are the last notebook from a 3-pack and I have a variety of different notebooks in this pile. These are notebooks that I just haven't got around to using, and are also ones I have around in case I find someone who may be slightly interested in Field Notes, I can pass a notebook along. Finally I have 26 partially opened 3-packs. A lot of these are the Two Rivers edition. I really liked the crazy letterpress designs on these notebooks and ended up ordering extras after initially trying out my first batch (lesson learnt this time round). I also have a few of the recent editions which fall into this little sub-category. I have tried and used other branded pocket notebooks but I have failed to latch on to them as there was usually something missing. For example with the Doane Paper that distinctive grid pattern in a pocket notebook is not something I can work with. The blue grid is super bright and I find the grid doesn't work so well in a small sized notebook. Therefore these are just left alone in my cupboard rarely, if ever, used. Calepino pocket notebooks are lovely and work really well with fountain pens but there isn't enough pull for me to grab one of these notebooks over something else. Nock Co. was another brand of notebook I enjoyed using and the reporter style was a nice change but again it's not a notebook I reach for regularly. I haven't tried the fountain pen friendly version of the Nock Co. notebooks, but these are added on the 'to use' list. The Baron Fig Apprentice and Word are new to me. These notebooks have not been used and tested enough for me to have an opinion just yet but I think the Word notebooks will be the ideal work notebook where I need to make use of to-do lists. To be honest I am not entirely sure. It definitely means I have a pocket notebook addiction. It means that I don't use pocket notebooks enough to warrent this huge un-used collection of notebooks. I don't encounter this problem with other sized notebooks. I have a small stash of larger sized notebooks that keep me going, and I know what I like to use and generally keep a couple of spare notebooks on hand. But with pocket notebooks this logic does not come into play. In the past I have obviously have suffered from FOMO, but my buying attitudes have changed and adjusted over time. I'm not perfect but now I buy what I like and I buy a sensible quantity rather than stupid amounts that I will never be able to use. I also suffer from an addiction to Field Notes specifically rather than any type of pocket notebooks. Mostly this is because of the seasonal releases that other brands don't have and results in me buying more than I need. If we only ever had the Kraft edition then perhaps I wouldn't stock up in the same manner. I also now use the Midori Travelers Notebook and this has been a constant in my life for a couple of months. The inserts I use mean that it won't replace my general note taking, however I do have a ruled insert as well and at the moment this has impacted on how much I reach for a pocket notebook. If I continue with the same system this could, in time, impact on how many pocket notebooks I burn through. This is not the end of my thoughts on pocket notebooks and how I use them. I like to record things, keep notes, make doodles and then refer back to them or flick through a random used notebook in the future. It helps me to see where I was at the time, what I was interested in and how I got there. In turn this guides me. I would love to hear your stories of notebook hoarding and if you have a particular notebook weakness please share the brand with me. I can't exactly remember when I started carrying around Field Notes notebooks but the first editions I bought were Red Blooded and Day Game so I can only assume it was around Summer 2012. After using my first few notebooks I became hooked on Field Notes and from there I have most of the seasonal colors releases. The only alternative pocket notebook I have tried is the Doane Paper Utility notebooks and that was very recently. I have seen a lot of photos of collections of unused notebooks but rarely a collection of used notebooks. Therefore I thought I would share my used collection here. The below photos shows around 2 years of my pocket notebook addiction. I love the used look to these notebooks and how they age with use. Most of them are full of nonsense, but it's a record of my nonsense at a given time. Since reading pen, pencil and paper blogs regularly one product which consistently popped up in reviews or review photos was Doane Paper. I was eager to try out this innovative grid + lines design unique to Doane Paper and tried to scoop up some of these notebooks. This was however a bit of a problem for me. Being based in the UK getting hold of any Doane Paper was a challenge. To buy Doane Paper directly from their website as an international customer you need to spend $100 and then there is an additional international shipping charge of $50. This is a pretty hefty investment especially when you have never tried a product before. Luckily after a bit of perseverance, and patience, I was pleased to see that Jet Pens started stocking Doane Paper and I was able to grab two sets of pocket notebooks at a reasonable price with good shipping costs. Problem solved. I opted for a pack of the garage series pocket notebooks mostly as a comparison against Field Notes and to try something new. In hindsight I should have bought the large utility notebooks, but this is something to add to the ever expanding wish list. The big difference with Doane Paper is the paper grid system. They do something I haven't seen in any other notebook combining the grid and line pattern - hence the name grid+lines. The result is a very different design which I guess works for a broader range of people merging two popular paper patterns into one. The bold lines on the paper work well standing out against the grid. The lines are much wider than you would find in any other ruled notebook as you can see from the photo below. I found myself following the line system far more than the grid, but that has been mainly as I have used these notebooks for note taking rather than any sketching. Because the ruled lines are much larger I have gone through one of these notebooks much quicker than I normally would with a Field Notes. Not necessarily a bad thing but something I wanted to point out. I found I didn't use the grid system in the notebooks at all. One small negative is I find them too small. 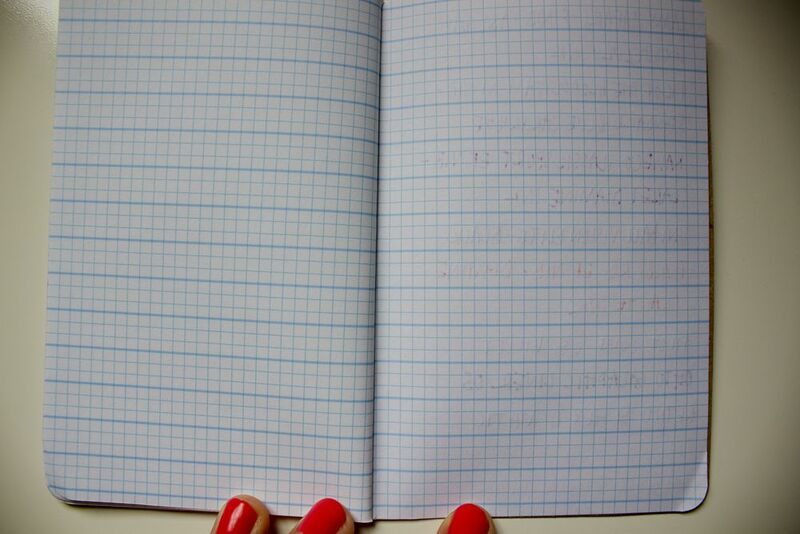 Again when comparing these to a normal graph paper notebook the grids are almost half the size. The Doane Paper garage series pocket notebooks come in three different colours, navy, brown and orange which have a worn and weathered look. The internal design of the garage series notebooks is simply the recycled paper stock. Unlike the Field Notes memo books there is no internal branding on these books. Personally for me this is a slight disappointment. I would love to see something on these internal covers, even if it was just room for your name and the dates started and completed. This is a big winner. The paper quality is far superior to Field Notes and can take a fountain pen. Hurrah! There is still an element of bleed through on the page but it's not enough to be irritating. This is a massive winner for me and I have found myself using a wider variety of pens that I normally would due to this simple aspect. Big win! These notebooks wear very well. I haven't bashed my notebook around too much but they feel very sturdy and can deal with constant pushing in and out of pockets and bags. Again an important feature for a pocket notebook and Doane Paper have got this aspect nailed down. Overall I like these pocket notebooks. I'm not sure they will replace Field Notes for me but they are definitely an alternative I would consider for different sort of uses. In hindsight I should have opted for the larger Doane Paper Utility notebooks. I think that the grid+lines system would be more usable in a larger notebook and would have worked better for me. Definately give these notebooks a try if you haven't done so already. If you aren't based in the US there are a few alternative etailers that you can get these from based in the US, just small shipping costs to contend with. If you love Doane Paper and are happy to order in bulk obviously you can buy direct but pay a larger shipping cost. To find out more about the Doane Paper story check this out.